Schematics and DMI-generated super-resolution images of a pattern of individual signals (top) and three different target species within the same structure that have been visualized using Exchange-PAINT-enhanced DMI method. Proteins don’t usually work in isolation, but rather make up larger complexes such as molecular machines that enable cells to communicate with each other, move cargo around in their interiors, or replicate their DNA. Yet even with the advent of super-resolution microscopy, the technology has not been powerful enough to distinguish individual molecular features within those densely packed complexes. Up to now, researchers only have been able to visualize closely positioned molecules or molecular complexes with 10 to 20 nanometer resolution. But by advancing technology, a team at Harvard’s Wyss Institute for Biologically Inspired Engineering has been able to distinguish features 5 nanometers from each other in a densely packed, single-molecular structure, achieving the highest resolution in optical microscopy. The team, led by Wyss core faculty member Peng Yin, used “discrete molecular imaging” (DMI), which enhances its DNA nanotechnology-powered, super-resolution microscopy platform with an integrated set of new imaging methods. The study was reported in Nature Nanotechnology on July 4. 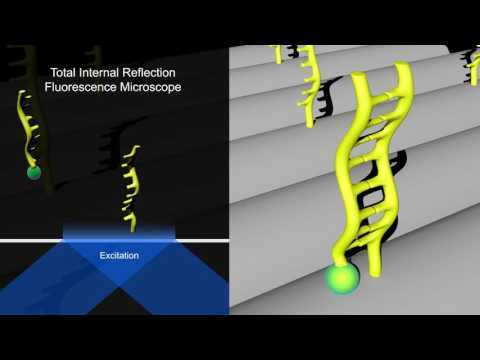 See in this animation how Discrete Molecular Imaging (DMI) uses DNA nanotechnology to reveal densely packed molecular features in structures as similar in size as single protein molecules. Credit: Wyss Institute at Harvard University. “The ultra-high resolution of DMI advances the DNA-PAINT platform one step further towards the vision of providing the ultimate view of biology,” said Peng Yin, who is also professor of systems biology at Harvard Medical School. Thee DNA-PAINT technologies developed by Yin and his team are based on the transient binding of two complementary short DNA strands: one attached to the molecular target that the researchers aim to visualize, and the other attached to a fluorescent dye. Repeated cycles of binding and unbinding create a very defined blinking behavior of the dye at the target site, which is highly programmable by the choice of DNA strands and has now been further harnessed by the team’s current work to achieve ultra-high resolution imaging. 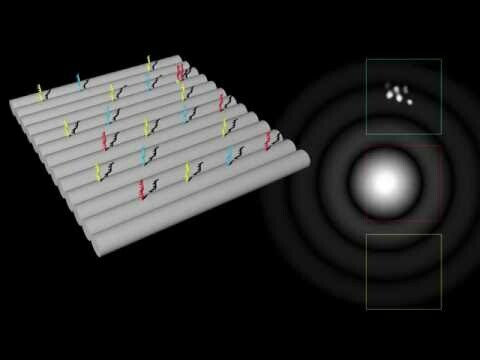 “Peng Yin and his team have yet again broken through barriers never before possible by leveraging the power of programmable DNA, not for information storage, but to create nanoscale ‘molecular instruments’ that carry out defined tasks and read out what they analyze. This new advancement to their DNA-powered super-resolution imaging platform is an amazing feat that has the potential to uncover the inner workings of cells at the single-molecule level using conventional microscopes that are available in common biology laboratories,” said Donald Ingber, Judah Folkman Professor of Vascular Biology at Harvard Medical School and the Vascular Biology Program at Boston Children’s Hospital, and professor of bioengineering at the Harvard John A. Paulson School of Engineering and Applied Sciences. The Wyss Institute’s scientists have benchmarked the ultra-high resolution of DMI using synthetic DNA nanostructures. Next, the researchers plan to apply the technology to actual biological complexes such as the protein complex that duplicates DNA in dividing cells or cell surface receptors binding their ligands. To read the full release, visit the Wyss Institute’s website. Radcliffe fellow and HMS professor Ann-Christine Duhaime, whose new project explores how inherent brain drive and reward systems may influence behaviors affecting the environment and global warming.